THE FOOTBALL ASSOCIATION of Ireland has today confirmed it has offered to bring forward their upcoming Oireachtas committee hearing. The meeting had been originally proposed for January, but was subsequently postponed until 20 February. That hearing then did not go ahead, as Delaney was unable to attend due to a clash with a Uefa event in Switzerland the same day. 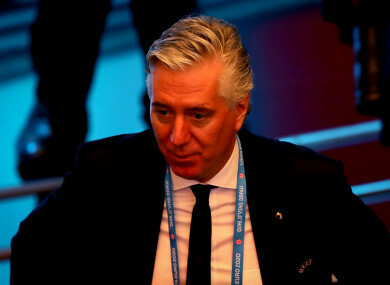 Delaney, who is part of Uefa’s executive committee, thanked the committee for facilitating a request to postpone the meeting until April and the association has now suggested putting it forward from 10 to 3 April. A statement read: “The Football Association of Ireland has today written to the Joint Committee on Transport, Tourism and Sport. “The Association has offered to bring the April 10th meeting with the Committee forward to April 3rd and the FAI awaits the Committee’s response. Delaney and the association have been embroiled in controversy over the past week, after it emerged that the chief executive issued a personal cheque worth €100,000 to the Football Association in April 2017. The CEO defended this move, explaining that it was a “bridging loan” and insisting that he had acted in the best interests of the FAI. However, there has been a considerable backlash to the news, with Sport Ireland among those seeking further clarification, and there are likely to be further questions asked of Delaney and his colleagues at next month’s hearing. Email “FAI offers to bring forward John Delaney's Oireachtas hearing”. Feedback on “FAI offers to bring forward John Delaney's Oireachtas hearing”.